This collection of pregens for the classic Curse of the Crimson Throne AP clocks in at 34 pages, 1 page front cover, 1 page editorial, 2 pages of introduction, 1 page ToC, 1 page SRD, 1 page advertisement, 1 page back cover, leaving us with 26 pages of content, so let’s take a look! All right, so first things first: The characters herein have been created with a 20-pt.-buy method, but for GMs and groups enjoying the added challenge, scaling notes for 15-pt.-buy characters can be found – nice! The presentation follows the by now tried and tested (and really nice) way of the pregen-books released by Legendary Games: We have a gorgeous full-color artwork for each of the characters, alongside a quote that represents the respective characters. It should also be noted that fold-up paper minis for all characters can be found herein. Now, let’s take a look at the characters and start with Ardimaius Trente – and a brief glimpse at the character will tell you that this martial master and compassionate soldier has a built-in reason to engage in the AP; here, an addicted friend. These tie-ins double as a kind of trait, mind you – and this ties into the very modules of CotCT. 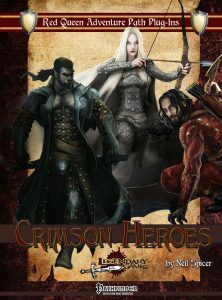 So yes, the pdf provides deeply-immersed tie-ins of character and module, but it does not stop there: In the tradition of these pdfs, we also have ties between the characters – love-interests, rivalries and the like…and yes, we have notes on character advancement as well as roleplaying advice for the respective characters. Khostur Khyle, half-orc urban ranger, is a tragic one: He is almost human…and his wife was brutally murdered…and while he can’t yet retrieve the ring from a pawnshop, he has found out who was responsible for him being all alone. He will not be denied retrieving the wedding ring….or making his foe pay. Lianna Ieduri, a half Varisian, half Vudrani tattooed sorceress is a sorceress with a heart of gold – and as a reformed criminal, she knows something about module #1’s first BBEG’s operation…and btw., she does come with stats for her viper familiar! Portia Cromathis can hear the spirits of the dead whispering to her – and thus she tries to honor dead and living alike, donning the identity of the Silversheen Ghost -the stalker specialization vigilante with her hauntingly beautiful artwork is most assuredly one of my favorites in the pdf…but then, no surprise there, right? ;P Oh, and she is looking for her missing nephew, once again providing a powerful motivator for adventuring, as well as some romance potential with a fellow pregen. Runyar Locklin, dwarven warpriest of Abaddar, has a rather powerful motivator as well – the man wants to restore the honor of his family…and with a history of connections and a tendency to not be 100% truthful regarding item-value, he makes for a slightly mischievous twist on the trope of what you’d expect from an otherwise classic character/class combination. Finally, there would be Virsaner Tayne, a half-elven dropout of Korvosa’s academia, victim of a smear-campaign paid for by a rival student, executed by, bingo, the boss of module #1, the conjurer with his raven familiar makes for an unkempt, if kind being who represents more of a down-to-earth guy, when compared to the glamorous, slightly femme fatale-ish Lianna. Editing and formatting are top-notch, I noticed no glitches. Layout adheres to a beautiful two-column full-color standard and the artworks for the pregens are really amazing. The pdf comes fully bookmarked for your convenience. Power-level wise and rules-wise, the pregens are all effective, on roughly the same power-level and they all manage to feel like organic characters. Neil Spicer’s pregens are amazing: Not only are they interwoven along one another, they sport intriguing personalities and come with strong motivations to become involved with the plot of the CotCT-saga. The diverse ethnicities and personalities collected herein fit well within the context of Korvosa and render this collection a great purchase for groups who want to pick up the AP and just play. Add the scaling and roleplaying advice and we have a great file that leaves nothing to be desired. Hence, my final verdict will clock in at 5 stars + seal of approval. You can also get a great bundle of LG’s cool pregen hereos here!